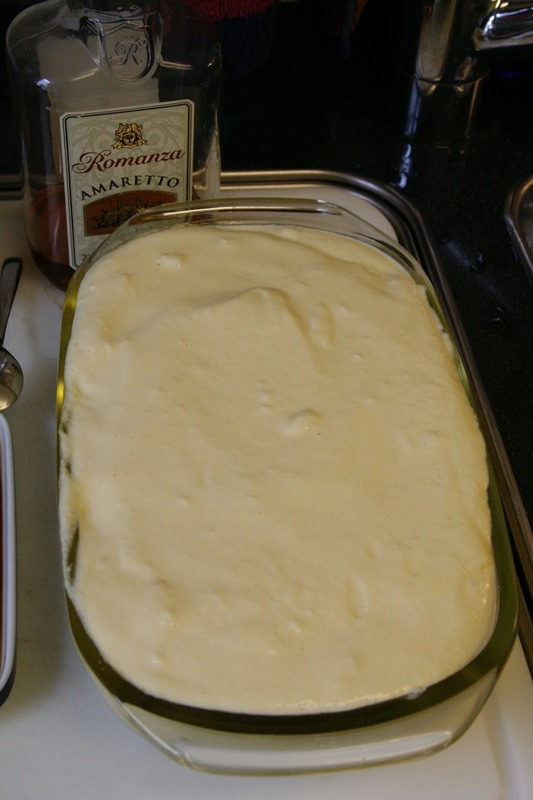 I have been making the wonderful Italian tiramisu dessert for many years now. It has been a huge success with all my friends – even with the Italian ones. As people keep asking how I make it, I wrote the recipe up here along with some explanations, hints and photos. Mascarpone is an Italian cream cheese. It is very rich and a bit sweet. 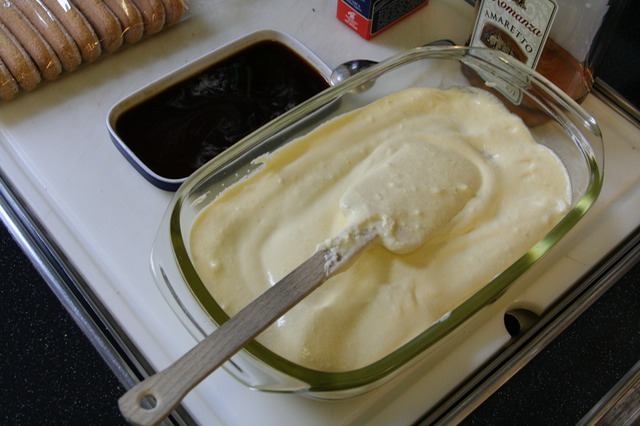 It is essential for the creamy taste of tiramisu, so replacing it by other cheeses like Quark (too sour, too watery), crème fraîche (too sour), Philadelphia (not smooth enough) or even custard will not give the same result. Use mascarpone or go for another dessert. Once you got the hang of mascarpone, you easily become addicted. It is nice with jam on fresh bread or with strawberries. But I digress. The tub of mascarpone I have in mind contains 200-250g. Eggs – you know the stuff coming out of hens. While I have never had problems with that, keep in mind that these eggs will not be cooked. So better use really good and fresh eggs. And consume the tiramisu within a day or two (easy!). A pack of sponge fingers containing two layers of fingers, or about 200g, should be the right size. There seem to be different kinds of sponge fingers. Lighter and thicker ones and denser but smaller ones. The lighter ones will yield a slightly more fluffy result but can make the tiramisu look weird because they'll easily float to the top of it if you don't have enough of the other ingredients. Amaretto is an Italian almond liqueur. 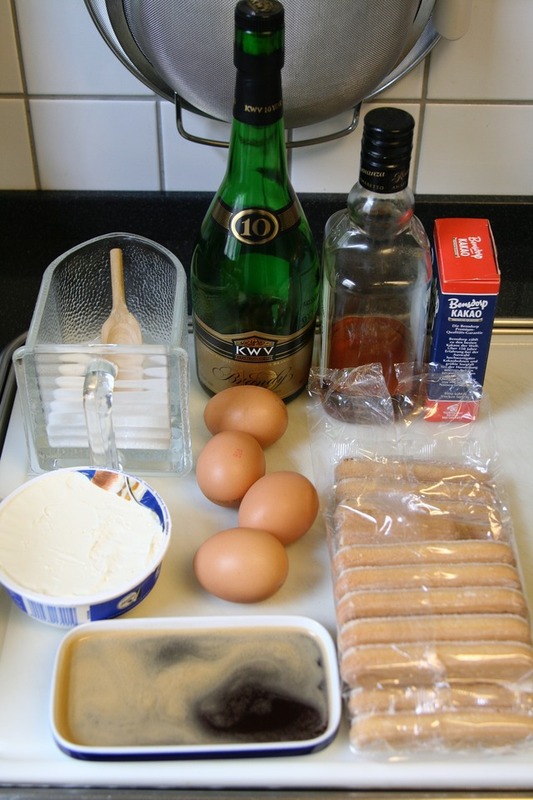 It is indispensable for making tiramisu as it is responsible for the characteristic taste. Personally I think it is too sweet to be drunk on its own, but some people like it with their coffee, hot chocolate or crêpes. Unless you have an Amaretto addict around, a bottle will last for ages. First, make the espresso. Once it is ready, pour it into a wide flat dish, letting it cool down a litte. You need to dip the sponge fingers in this later on, so have that in mind when choosing the dish. While the espresso is cooking, separate the egg whites from the yolks. Then beat the egg whites. You need them extra stiff as they will provide the slightly airy texture to the crème later on. 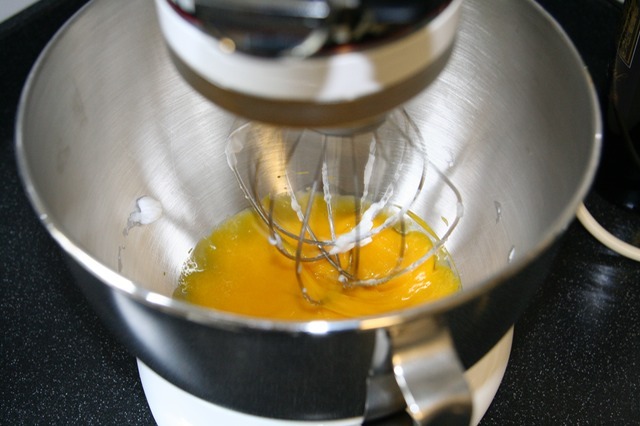 While there is no need to rush, it is advisable to work as quickly as possible after this – avoiding any lengthy breaks – to make sure the beaten egg-whites will not become liquid again. Placing them in the fridge after beating them might help. Next beat the egg-yolks. 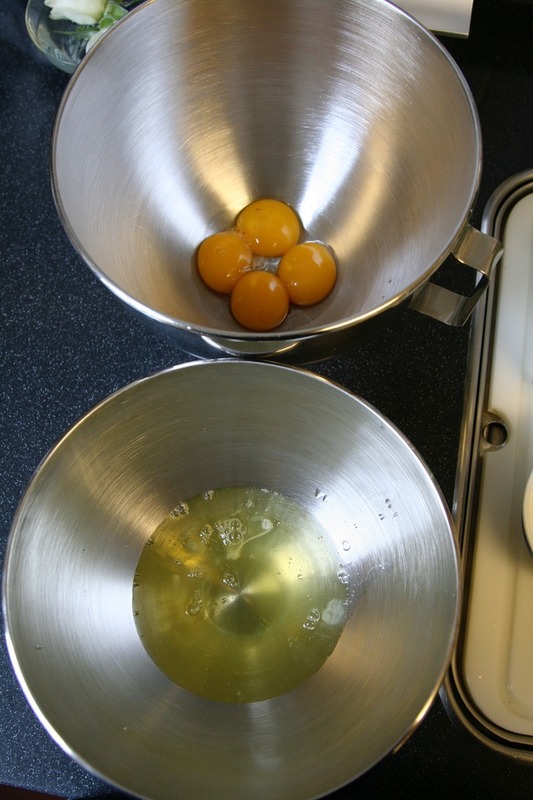 [Lazy note: Doing things in this order means you can use the same tool to beat both the egg-whites and the egg-yolks without needing to wash it in between. That wouldn't work the other way round.] The yolks will become creamy and white-ish. Then add the sugar and a dash of Amaretto and continue beating. 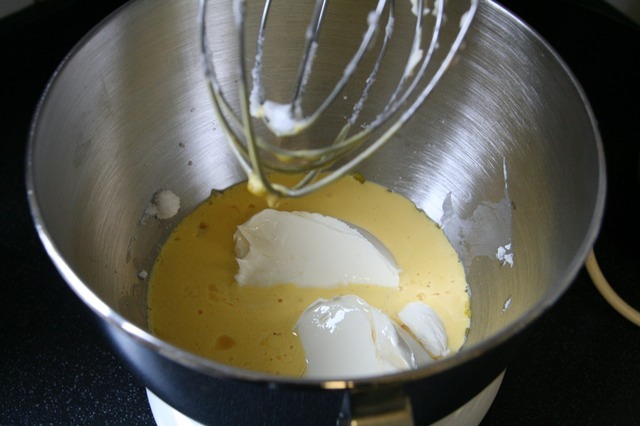 After a while, add the mascarpone and beat until everything is nice and homogeneous. Add more Amaretto to taste – but keep in mind that some additional Amaretto will be added later on, so don’t overdo it. I quite like to also add a dash of brandy at this stage which gives a little sharpness to the taste. 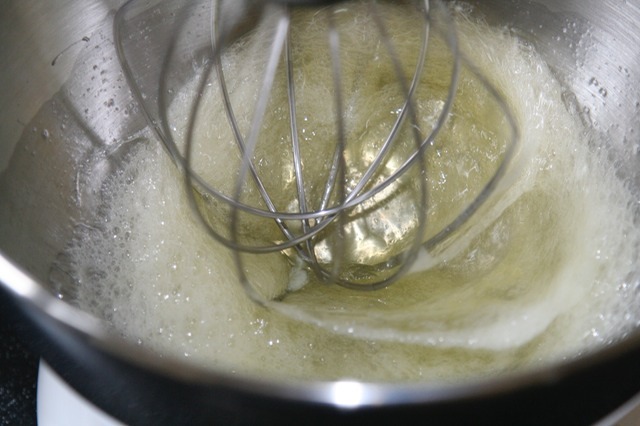 Next, gently drag the stiff egg whites under the creamy substance. This is best done with a large flat scraper or so. 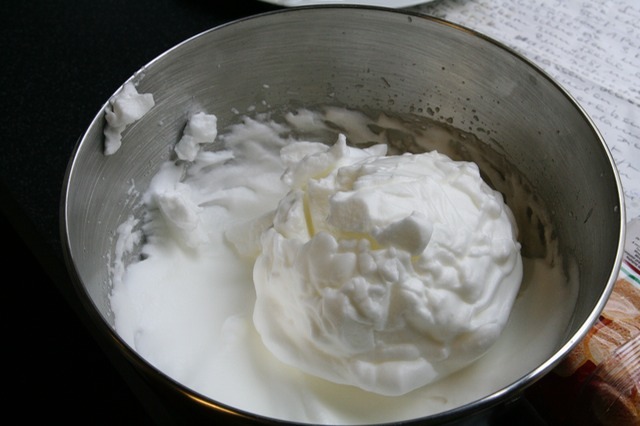 Treating the egg whites too roughly will make them break down, so you need to be a bit more careful here than when just stirring. You shouldn't see any more lumps of the beaten egg-white after this. Now comes the fun part: Get a small (about 18cm×27cm / 7in×11in) pie dish out. Any shape will do but rectangular ones make placing the sponge fingers in there easier. Dip a sponge finger’s bottom side quickly into the espresso (which may also contain a dash of brandy if you are so inclined) and place it into the dish. At this stage you get to choose how strong the coffee taste in your tiramisu will be. 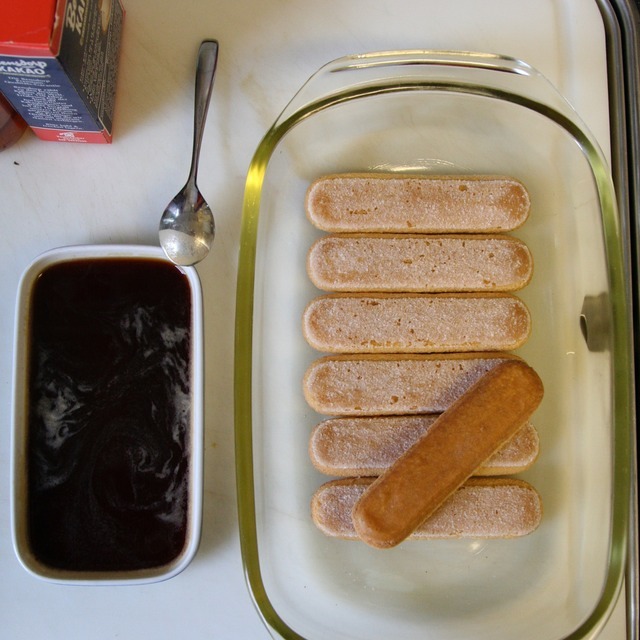 Dip the sponge fingers for a brief moment and they will just soak a little, just giving the hint of coffee taste. Hold them in the espresso for a while and you’ll get a very coffee-ish taste. I prefer a short-ish dip, but opinions on this vary widely. Sponge fingers also vary widely in how quickly they take up the espresso. You will just have to figure that out with the first few fingers from the pack you have. If you want to go for the strong coffee taste, you may need to make a few extra cups of espresso to begin with. Fill the whole bottom of the dish with sponge fingers lying side by side. Then use the bottle of Amaretto and sprinkle some on top of the sponge fingers. Your fingers and Amaretto bottle will likely be sticky after this. …and repeat the dipping-into-espresso, laying-out-the-sponge-fingers and sprinkling-the Amaretto to create a second layer atop the first one. Depending on the shape and size of your dish the second layer may need more sponge fingers and crème. Keep this in mind when making the first layer. If in doubt, save a bit more of the crème on the top layer. You have to do this because there is a lot of air in the sponge fingers and they have a tendency to start floating in the semi-liquid crème after a while if there is not enough of it above them to cover them reliably. 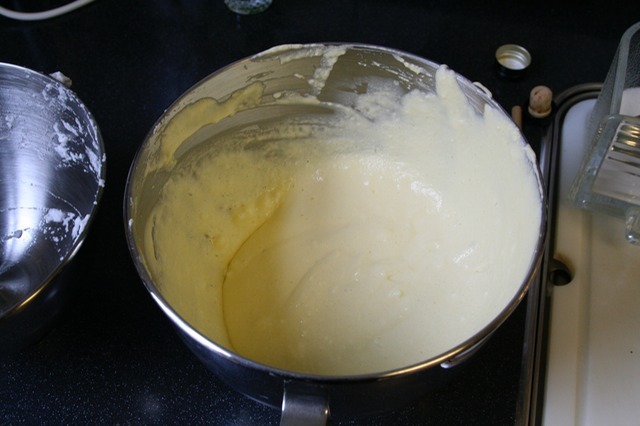 If you are reading this and your meal starts in an hour then you are in for a problem: The next step is to put the tiramisu into the fridge for some hours so there is time for the sponge fingers to be completely soaked and softened. I usually prepare it the day before serving it, but if you like getting up early, it works as well to prepare it in the morning. Finally you should sprinkle a thin layer of the dark cocoa powder on top of the finished dish. Depending on whether you want the cocoa to be slightly shiny and wet or dry you do this either before putting it into the fridge or just before serving. That’s it. Enjoy! This tiramisu serves 5 to 8 people. 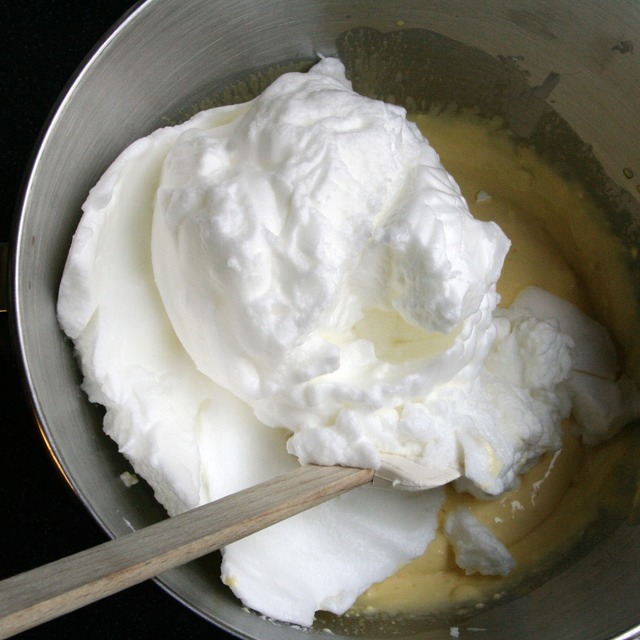 If you expect more guests, I recommend repeating the whole process twice as dealing with larger amounts of whipped egg-whites seems to be a bit complicated.